Flying is a daring experience and it stays with you even if you never do it again. Sri Lanka (then Ceylon) made headway in joining its friends in the sky 100 years back when it took off on December 7, 1912. Since then flying out of Colombo has never been a dream but an experience that people live and continue re-live. The date is marked with two Frenchmen Georges Verminck and Marc Pourpre who managed to take off in Bleriot aircraft, fly to the Sri Lankan skies and land safely. For most Sri Lankans (then Ceylonese) who queued up in the early days to buy a ticket to simply take a look at the wonder machine capable of flying, dreams began to come to life. Sir John Kotelawala, then Transport and Works Minister promoted private flying through the Aero Club of Ceylon in the 1930s. The first airstrip at Ratmalana that still stands today was opened in 1938 alongside the inauguration of the first direct regular airmail service under the British Empire Air Mail Scheme (AMS) from Sri Lanka, documents released from the Civil Aviation Authority in Colombo stated. Today the same airport is run by the Sri Lankan Air Force. World War II created space for the establishment of new airstrips at Katunayake, Vavuniya, Puttalam, Trincomalee and Palaly in addition to a sea plane base at Koggala for military aircraft operational activity. Ratmalana was used for overseas bound commercial flights until the early 1960s. The Business Times met up with one of those from the early years of Ceylonese civil aviation who were part of the making of history at a time when staff involved in the industry were considered as “demigods,” as we were told. The government purchased three war-surplus Douglas DC 3 Dakota aeroplanes and these were christened Sita Devi, Viharamaha Devi and Sunethra Devi, three queens and carrying the Air Ceylon on its fuselage. These three were initially used extensively for pilot training and route proving duties. In June 1947, at the suggestion of Sir John Kotelawala, Viharamaha Devi flew to London to collect a valuable cargo of electoral registers for the coming elections. On Wednesday December 10, 1947 with Capt. Peter Fernando at the controls and a complement of 16 passengers, Sita Devi took off from the Ratmalana airport for Palaly and then proceeded to Madras returning to Colombo by the same route later that day. 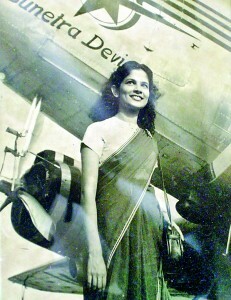 The first air hostess on that flight was Air Ceylon’s receptionist Miss Mavis Wijeratne. The aircraft was readied with each aircraft having a capacity of 21 slumber lounge seats cushioned in blue, carpeted blue and the panels and windows light blue. “When we heard that we are going to have Air Ceylon we were quite thrilled,” former Trainee Engineer at the Department of Post and Telegraph D. L. Sirimanne who later joined Air Ceylon recalled during an interview with the Business Times on the country marking 100 years in civil aviation. He noted that they were asked to check the communications equipment at the Control Tower at the Ratmalana airport locked up and sealed by the Royal Air Force (RAF) when they left. Once the team from the department checked the controls they ensured that all installations were checked, repaired and made operational. On the day of the flight there was a big gathering to see the flight with VIPs and it took about one hour and 35 minutes one-way, Mr. Sirimanne said. Afterwards, he said there were daily flights on this route due to trade and travel for local artistes and lawyers at the time. Some of the famous personalities that would frequent these flights were G.G. Ponnambalam, Eddie Jayamanne, Rukmani Devi, S. Chelvanayakam, Sir John Kotelawala, D.S. Senanayake and lots of students leaving for Madras for higher education. 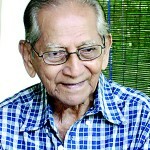 Mr. Sirimanne explained that when he first went on his flight to Madras his father could not believe he had been able to make it back in the same day since it had taken his father nearly two days to ferry across and take the train to Madras. “During that time the air crew was treated like demi-gods,” he said adding that since there were just a few everyone knew each other. Air Ceylon also carried out charter flights from Colombo to Sydney carrying ships’ crew. Mr. Sirimanne explained that the flight would take about a week flying via Madras, Karachi, Rangoon, Singapore, Jakarta, Kupang, Darwin, Charleville, Cloncurry and then Sydney. But the return journey would last only four days when they would fly via Darwin, Bali, Singapore, Calcutta and Colombo. In addition charter flights were operated for Muslim pilgrims to Jeddah, he said. Mr. Sirimanne observed that at the time when Air Ceylon started it the crew had to ready itself well ahead since they would have to collect the required charts since the aircraft had only one Automatic Direction Finder (ADC). Other necessities were radio beacon, operation equipment, weather reports, aerodrome controls and operating frequencies of the airfields. When flying to Australia on a chartered flight, Mr. Sirimanne explained, they had taken off for Karachi and then flew to Rangoon. However, the weather was not promising and Capt. Peter Fernando decided it best to fly direct to Singapore. But the Air Ceylon crew was faced with an issue at the time since they were without any navigational aids due to thunderstorms looming as a result of which the aircraft was virtually lost. “I had to send an SOS and then an aircraft responded and said ‘Follow my beacon’ and we followed it and in 45 minutes we were in Singapore and there were no issues and we landed safely,” he related. Once, on route to Jeddah Air Ceylon took passengers with another lot to be picked up from Colombo and then they received a signal to say passengers were to be taken to Cairo and Damascus. It was agreed upon but when they attempted to land in Cairo they were asked to head to Eltor (an airstrip with a shack for an aerodrome) and quarantined for three days for Yellow Fever. But, once the signal was given for them to head to Cairo upon arrival they found pilgrims from Mecca waiting to board the aircraft with barrels of Holy Water; this request was refused by Capt. Fernando who asked for these to be shipped. The aircraft personnel were well respected even by the leaders of the country at the time. Once when the crew was in Cairo they were provided accommodation at a hotel in which former Prime Minister D.S. Senanayake was also staying during one of his overseas trips. He had taken time out to meet them as well, Mr. Sirimanne said. Another episode that still was fresh in the mind of Mr. Sirimanne was when they formed part of the delegation that took Sir John Kotelawala on a visit to Jaipur. He related that on this chartered flight to India they were also accorded the same welcome as the head of the state and were also taken on elephant back to the castles for lunch there and were given a conducted tour as well. In another incident, he observed that once a passenger while flying opened a window to spit out! He recalled that the attendant on hand hurriedly informed the pilot who then managed to pull down the window shut. Mr. Sirimanne said that in those days with no air conditioning inside the aircraft, the cockpit windows would be opened, now and then, to allow air to circulate to allow the foul air inside the cabins to be sucked out. He is married to former stewardess of Air Ceylon Ms. Olga nee De Silva who had served for two years with the carrier. Her face was the advertisement for the country’s only national airline. Mr. Sirimanne met his wife while working at Air Ceylon, since she too was one of the first few flight attendants in the early years. She reminisced the days when the first batch of stewardesses comprised Ms. Cynthia Phillips, Ms. Olga Rupesinghe, Ms. Dharma Kanagasaby and herself. “I was very excited,” she said as it proved to be an opportunity to travel and visit places but later found the job to be a bit of a bore ‘because our flights were to Madras – Jaffna and back.’ Once a week they were able to fly out to Karachi as well, she said. But interestingly, their chances of visiting places was limited since they were always busy, she said but recalled her experience of a few charters to Delhi and Mysore. But she said they could never lunch in Madras or Trichy during their flights to these destinations. She recalled an incident when Capt. Emil Jayawardena had brought down a donkey from Trichy, India and he had wanted to take it out quietly. But upon landing at the Ratmalana airport the poor animal (most likely out of fatigue) just took off and started running about the air field. It was later taken back to India as it was not allowed to be brought into the country, she recalled smilingly. During her career she had met some interesting personalities of the likes of former Premier Senanayake when they flew to Bombay to meet Indian Prime Minister Jawaharlal Nehru before the two headed for London from there. She recalled Sir John to be a ‘very loud person’ and Rukmani Devi, renowned actress, as ‘very ordinary’ during one of her trips coming from Trichy. Travelling in an aircraft that had a lot of limitations compared to those that are available today, Mrs. Sirimanne observed she found it quite nauseating when certain women would apply strong perfume onboard the aircraft. Another interesting episode in her life was when they took wing Air Ceylon was the first carrier to adorn their air hostesses in sari and so ‘wherever we landed all eyes were on us��.they really admired us,’ Mrs. Sirimanne recalled.At the time, there were no night flights and being single was a requirement for flight attendants,she pointed out. 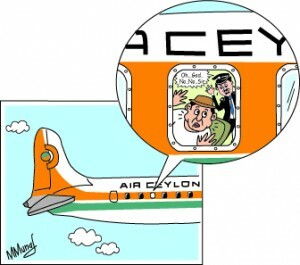 Air Ceylon was significantly used by traders and it was recalled that just prior to former Prime Minister Sirimavo Bandaranaike imposing a new regulation regarding imports, traders transported sarongs via air on eight of its flights. During its lifespan from 1947 to 1978, Air Ceylon entered into partnership with four international airlines namely Australian National Airways (ANA), KLM Royal Dutch Airlines, British Overseas Airways Corporation (BOAC) and French airline UTA. UTA provided a Douglas DC-8 jet for the long haul services and it was operated with UTA pilots and a Sri Lankan cabin attendants. But the DC-8 was subsequently bought outright by Air Ceylon and it was a totally local crew. Then, on September 1978 one of the Avros parked at Ratmalana, exploded from a bomb planted inside the aircraft after a trip to Jaffna. There were no casualties however. Air Lanka came into being in July 1979 and was set up by the Government and initially had two Boeing 707 jets on lease from Singapore Airlines, but Air Lanka ended by keeping the Boeing 707s while a Boeing 737 was acquired for shorter routes. The state-owned carrier was part-privatised to Dubai based Emirates Group in 1998 for a 10 year strategic partnership that provided exclusive rights for all aircraft ground handling, airline catering at Colombo-Bandaranaike airport for this time frame and use of the country’s traffic rights for six years. Its name also changed to SriLankan Airlines. Over the years, it improved on its fleet but the management contract expired on March 31, 2008 with Emirates selling its stake in shares to the Sri Lankan Government at US$53 million in 2010. Later, the island nation saw the emergence of a budget carrier taking off from its shores Mihin Lanka, which was incorporated in 2006. It operates to destinations in the sub-continent and the Middle East. The Katunayake airport initially had a passenger handling capacity of 1.5 million per annum but was subsequently expanded to six million with one pier and connecting eight aerobridges, under the Stage I – Phase II of the Airport Development Programme which was completed in November 2005. A second airport constructed in Mattala would be inaugurated in March this year as part of the need for a second airport within the country and the necessity of establishing an air-sea hub in Hambantota. The terminal building could handle a capacity of one million passengers. Interesting titbitsIn those days, prior to take off passengers would be served with a ball of cotton wool to stuff in their ears since they start crackling due to the variation of pressure. They would then be seated and strapped and smoking was not allowed but a sweet was given upon take-off. There was no air conditioning as there was no pressurisation and smoking was allowed when flying and passengers were served a cup of tea and breakfast.Previously the flights could accommodate 21 passengers but this increased to 27 later adding that stewardesses found their job difficult at the time since passengers would very often ring them when they get sick.Another interesting feature of flying in the early days was that passengers would board the aircraft but have to wait until the crew was ready to take-off after they had all had their breakfast. Also, the passengers were allowed to have their relatives and friends come onboard prior to take-off to wish them farewell before departing.